Please join the Massachusetts AFL-CIO and MassCOSH at a legislative co-sponsorship event. Unions are welcome to bring priority pieces of legislation with sign-on sheets in order to solicit legislative co-sponsors. Join us at Tavern in the Square’s Central Square location for food, drink, and a chance to hear about opportunities to get involved with health & safety campaigns and projects! We invite occupational health students and professionals of all stages to come together to share experiences and resources with each other. 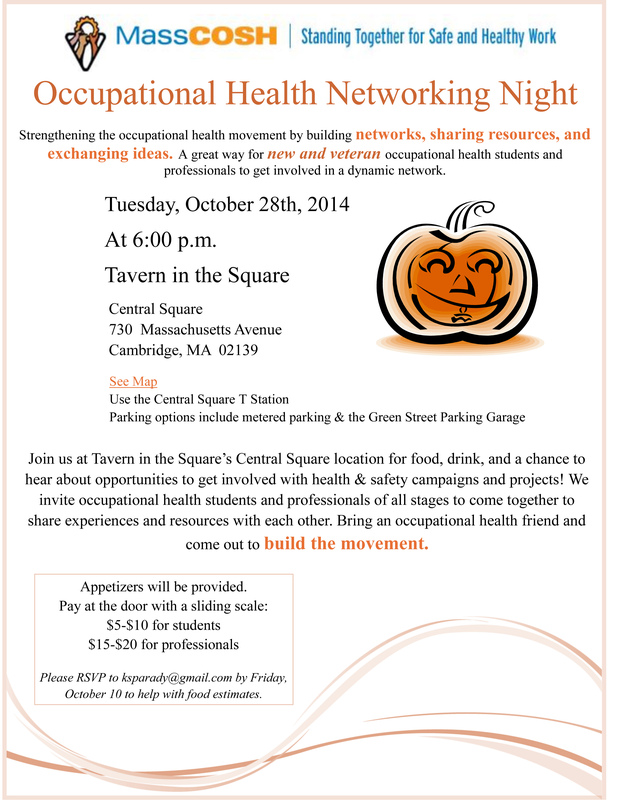 Bring an occupational health friend and come out to build the movement. Click here for our flier! We know it seems like ages away, but please plan on joining us for Celebrating the Movement - The MassCOSH 38th Anniversary Annual Event! Click here to buy your ticket and help us recognize all those who fought for Massachusetts workers and their families. 100% of your ticket proceeds will help MassCOSH continue the fight for good, safe jobs. Would you like to congratulate our winners as part of our program book? Please email jeff.newton@masscosh.org for details. State House Grand Staircase, State House, Boston. Join the Advisory Committee on State Employee Safety and Health, including state employee unions, MassCOSH, and the Patrick Administration as we release the official Report on EO511/State Employee Health and Safety Achievements and Recommendations. This is a great opportunity to celebrate the achievements of EO 511/State Employee Health and Safety and advance legislation to extend health and safety protections to state employees. Chuck Levenstein, Workmen’s Circle member and co-editor along with Madeline Kangsen Scammell of The Toxic Schoolhouse, and Tolle Graham, Acting for Economic Justice co-chair and author/contributor of Who’s Sick at School: Linking Poor School Conditions and Health Disparities for Boston’s Children - invite you to join them for a short roundtable discussion and celebration for the recent publication of The Toxic Schoolhouse.